In 2007, Ken visited villages throughout Kenya and Sudan. While in Africa, he met children who had yet to be given a name. Because one in five children die before the age of five, many of them spend their early life without a name, being called simply child, boy or blessing. Many of the deaths are caused by waterborne-illnesses, avoidable and curable with the right resources. He was moved by the plight of these children and the people he encountered. goal: Provide one billion people worldwide with water by 2020. Three months later, Ken founded WATERisLIFE, a non-profit with the goal of providing safe drinking water to 1 billion people by 2020. WATERisLIFE believes that of all of the crises that plight the world, tackling the water crisis is achievable. In a world of over 7 billion, if 1 billion people donate $1 each, we would have the resources necessary to solve the World Water Crisis. WATERisLIFE has a compelling story and goal, but it exists in a cluttered space. There are hundreds of NGOs in the US alone that support foreign and domestic water projects. Increase brand awareness and create a loyal donor base to drive donations. In general, engagement is highest when posts leverage mages of individuals/benefactors highlighting actual outcomes of donations. Posts that mention celebrity-level influencers and highlight key partnerships with popular brands also perform better than others. For millennials, giving back is important, but more than that, they like knowing that their contribution is actually helping others. 60% of millennials identify seeing the impact of their donation as critical in their decision to donate (Blackbaud, 2013). Additionally, 70% of millennials feel they can trust organizations that report how their financial contribution is being used (Achieve, 2011). Their donations are smaller, but a higher percentage of them are donating. 84% of millennials make yearly contributions, in comparison to 595 of Gen X and 72% of Boomers. 52% of millennials are “very open” to smaller, monthly donations and 62% donate via a mobile platform (social or web). hen it comes to the type of donations made, GoFundMe-style campaigns are gaining popularity, with an increase of 7.2% in 2016. Millennials make up about 33% of all donations on crowd-funded websites. The Socially Conscious Truth-Seekers are 25-34, graduated from college and more established than younger millennials. Having been in the workforce for a few years, they have more of an income to commit to charitable contributions. They have been raised in an environment that values giving back to the community and many of them have been volunteering since a young age. Social responsibility is extremely important to them and they are loyal to brands that give back. They are motivated by honesty and authenticity. They want to feel a connection with the brands they are supporting with their hard-earned money. These millennials are on the threshold of their prime spending years, and with the largest spending power in history, they already account for $20 billion in purchasing power; that's a lot of money that could be donated. Across the category, posts that very clearly articulate the direct impact of contributions and show success stories perform the best. WATERisLIFE is rooted in a very personal story, Ken’s journey through Kenya and Sudan, and because of that, the organization has equity in authenticity, a very attractive quality to our mindset. The strategy is to take this authenticity one step further to drive engagement and encourage micro-giving, a behavior that our target already displays. We will differentiate from others in our category with three main post-types that appeal to our audience’s established behavior. Our main focus will be instagram for our highly visual posts and we will use Facebook to publicize our micro-giving campaigns. 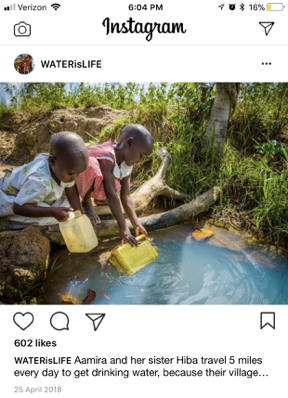 Instagram posts will show pictures of benefactors or people we are trying to help. We will post live updates on the projects and express gratitude to our followers and supporters. Facebook will highlight our campaigns which will have tangible goals, similar to the format used on gofundme and similar platforms. The goal can be anywhere between $500 and $30,000 and will have a background story about what the money will be used to do, for example building a water kiosk, sending LifeStraws to a village or building a Sun Spring System. Full text: Aamira and her sister Hiba travel 5 miles every day to get drinking water, because their village does not have a well. $2000 will allow us to install a Sun Spring water system. Click the link in bio to contribute $5 or $10 to bring clean water to Aamira, Hiba and their village! #enditnow.